In my opinion, belly of pork is the most satisfying joint to roast. Its meat is always moist, sweet and juicy because of the layers of fat that self bastes the joint as it cooks. Keeping the bone in adds extra flavour. And of course the pièce de résistance is the bubbly, crispy crackling of a well cooked joint. The whole dish always guarantees enjoyment by all. This joint was roasted on a bed garlic, chilli and fennel seeds to help keep it moist during the cooking process and of course to flavour the meat. Towards the end, the skin is taken off and roasted in a separate pan to crisp and bubble up. The meat is anointed with the drippings and gets a final stint in the oven where it browns and caramelises. 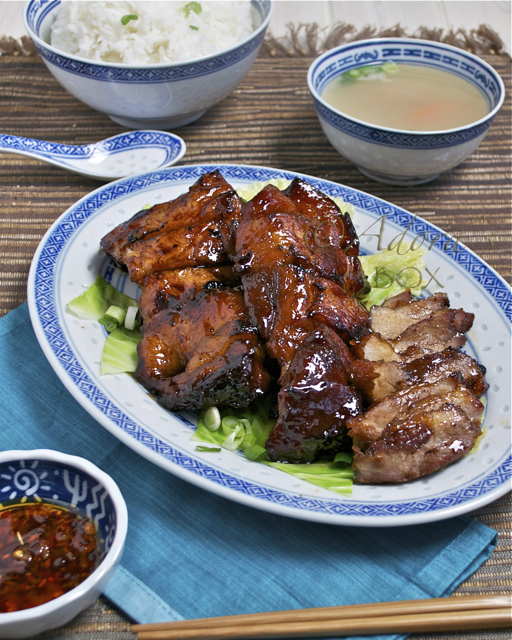 The meat that ends up succulent and intensely flavoured is served with the reduced spicy drippings as its sauce. Sprinkle the skin of the pork joint with 2 tsps. of salt. Leave on a tray. The salt will draw out the water from the pork skin, dry it out and make it crisp out when roasted. Pre-heat the oven to 400° F/ 200° C. Line a sturdy roasting tin with a large sheet of aluminum foil, big enough to wrap the whole joint. Combine the rest of the ingredients except for the water and honey and pour in the middle of the foil lined roasting tin. Wipe the moisture and excess salt off the skin of the pork and brush with oil. Set the joint on top of the garlic and chilli mixture in the roasting tin. Roast at the pre-set oven temperature for 20 minutes. At the end of this time, wrap the foil around the pork and seal. Then lower the temperature to 350° F/ 180° C for about 2 hours or until the meat is tender when pinched. Take the pan out of the oven and carefully pare the skin off with a sharp knife. Return the meat to the roasting tin and baste with the juices. Lay the skin on another baking pan and drizzle once more with oil. 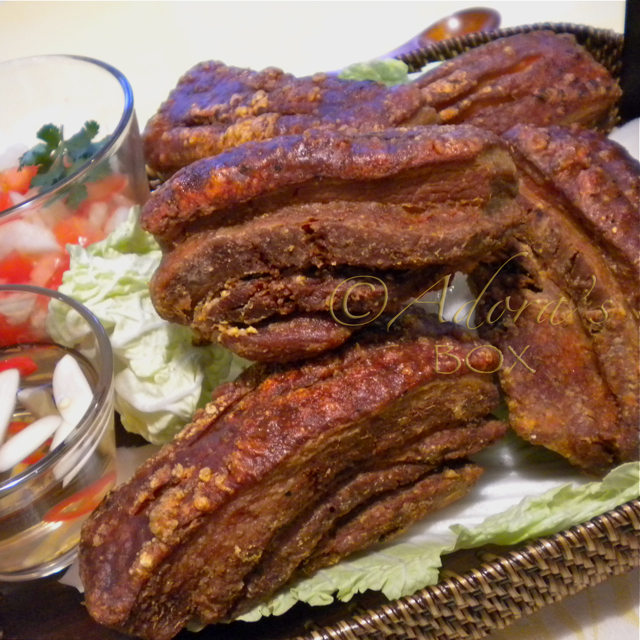 Raise the oven temperature to 400° F/ 200° C. Put both pans in the oven, with the pork skin on a higher rack. 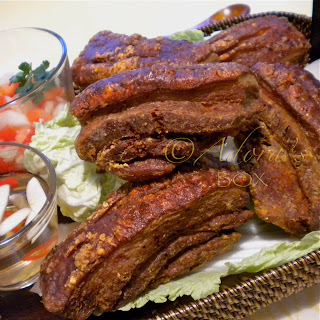 Roast for another 30 minutes or until the pork skin is crisp and bubbly all over. Take out of the oven. Drizzle the pork meat with the 2 tbsps. of honey. Let rest before slicing. Chop up up the rind and serve with the meat and the sauce. This looks sooo good! I know my boys would absolutely love it. I will have to use boneless belly pork as we do not get it attached to the bone here. Oh my..this is to die for!..lol..it looks so good and the photo is terribly great... yum yum! 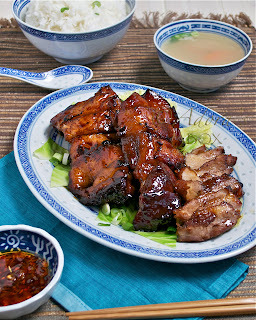 I love pork belly and smothered in that glistening sauce, my mouth is watering. Haven't eaten yet and I would love to have a bite of that! Ohhhhhhhhhhhh Adora! THIS is great! I think my husband will eat like half of it. ;-) We all like pork belly here and your juicy pork belly meat is amazing. And I love how you season it. 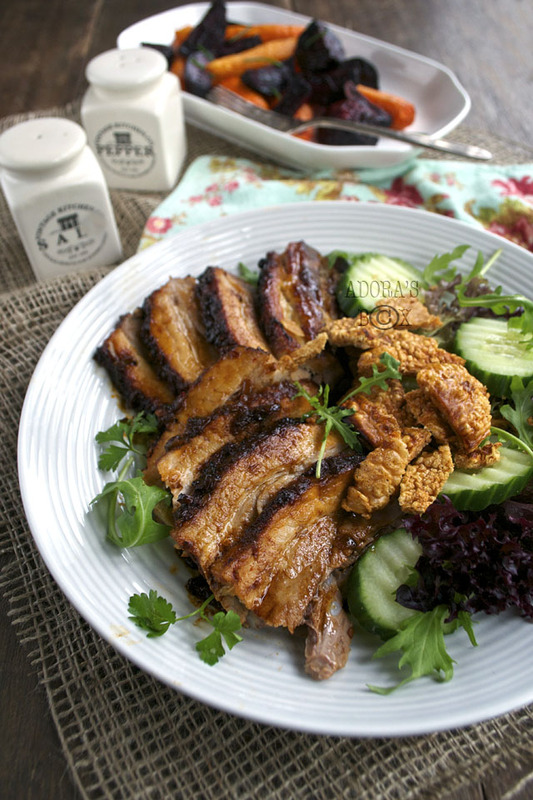 Your Chinese Style Roast Belly of Pork looks great too. What a great cook you are. Now I thought I'm going to eat "light" by eating soup and veggies, but I can easily change my mind if THIS is in front of me. your pictures are mouth watering and the colors are absolutely gorgeous ! Wow what a plate of good food to eat there! I love this recipe, Adora! And thanks for the link. The Asian touch to all your recipes is irresistible! This looks so flavorful and colorful! I love it! 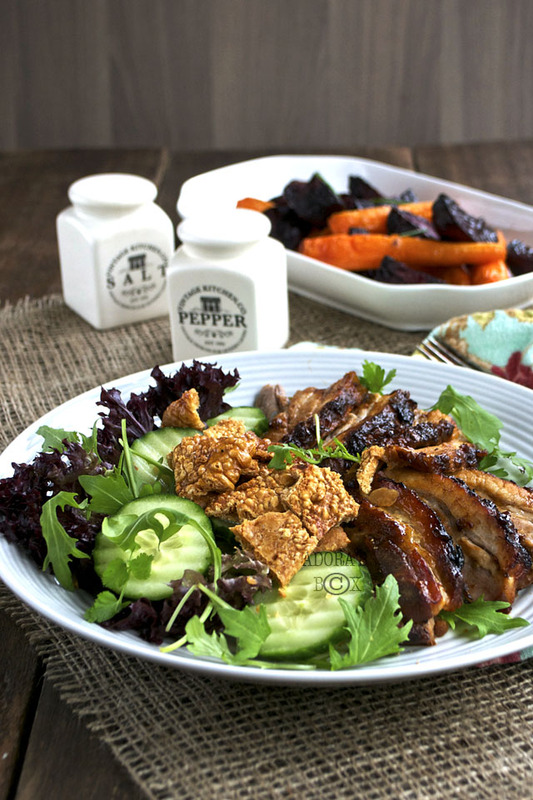 This post is making me drool...the roast pork belly looks so delicious!! This looks so incredibly delicious...! I've not had breakfast yet so this post makes me even hungrier...;). 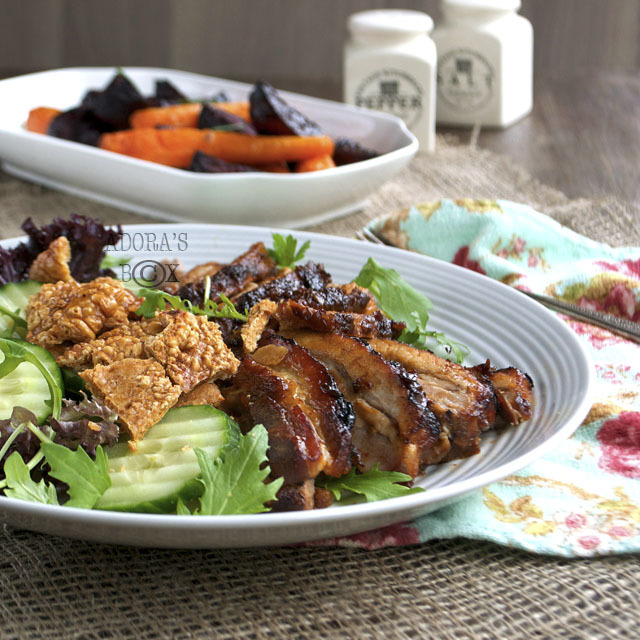 I absolutely adore pork belly and this flavor combination is out of this world. 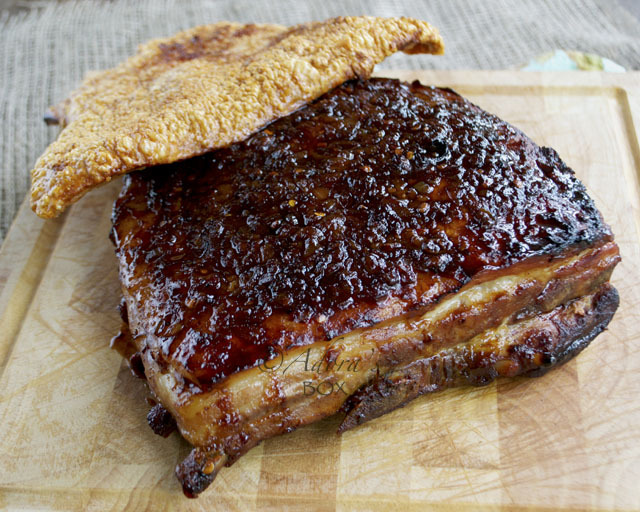 Pork belly is my favourite....looking at it just makes me drool. You are indeed a great cook.